Shopping is, by and large, a visual activity, from getting to the store to finding an item to paying for a purchase. But how is the retail experience affected by a visual impairment? In the first Canadian study of its kind, two Ryerson researchers have found that people with low vision face unique challenges while shopping and retailers need to improve how they accommodate the needs of this particular group. Hong Yu is interim director of the Ted Rogers School of Retail Management and Sandra Tullio-Pow is a professor in the School of Fashion. With a grant from the Ryerson Interdisciplinary Fund, the professors examined retail design and the needs of the visually impaired. The duo's work has been presented at a number of conferences and their paper, which also involved Ammar Akhtar, Retail Management '14, was published recently in the Journal of Retailing and Consumer Services. According to CNIB, more than 836,000 Canadians are living with significant vision loss. While normal vision is considered 20/20 and 20/200 or worse is classified as blindness, low vision falls between 20/60 and 20/190. The condition is commonly caused by age-related deterioration of the eyes. In 2005, the Accessibility for Ontarians with Disabilities Act (AODA) became law, with the goal of making Ontario fully accessible for the disabled by 2025. Shopping, however, continues to be a daunting task for those with disabilities. 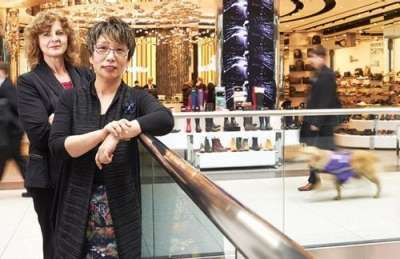 "This study is a good benchmark because it shows how retailers are doing in terms of the AODA," says Yu. Three focus group interviews were conducted with 17 participants who have low vision. The findings highlighted many challenges, including: mobility and getting into the store; judging quality; distinguishing colour; reading labels, store signage and receipts; negotiating store lighting, merchandise layout and fitting rooms; and interacting with sales associates. People with low vision, explain the researchers, aren't typically offered assistance while shopping because they often do not use a white cane. Other times, fear and a lack of training led some store associates to "duck behind a counter so they don't have to serve you," said one subject. "[The fear] is we're going to ask them for more help than they're prepared to give. Or they're going to expend far too much time for far too little return." Those reactions, says Tullio-Pow, indicate change is needed in the retail industry, especially as baby boomers age. For instance, the researchers recommend that store associates receive training on how to provide appropriate assistance in a sensible way to customers with low vision. In addition, stores should have a straightforward and logical layout, easy-to-read signage, aisles that are wide and unobstructed, and lighting that's uniform and not too bright. "It's about going beyond compliance with AODA to accommodate needs," Tullio-Pow says. "It will be helpful to think in human-centred ways." Doing so, adds Yu, will reap financial benefits for retailers. "Previous research has shown that when retailers accommodate others, they see a return on investment in the form of loyal customers," she says.